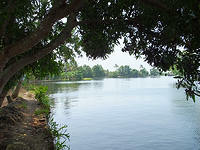 Next day we drove to Alleppey. 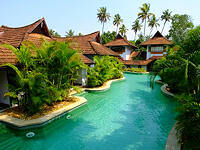 On arrival we visited the Kumarakom Lake Resort for lunch and inspection. This is a wonderful hotel which as the name suggests rests at the the edge of Lake Vembanad with its natural beauty & tranquillity. The hotel is built in beautiful landscaped gardens of lawns, ponds, waterways, palm trees & exotic flowers surrounding the villa style rooms which all are large with excellent decor of wood-panelled walls & antique furnishings. The pool villas are very special, each opening directly to the 250-metre long sepentine swimming pool. The main swimming pool is at the end of the hotel bordering the lake. This gives a fantastic view of the lake beyond, We are going to use this resort in our Deluxe hotels category. The next hotel to visit was the Coconut Lagoon This hotel is in a very unique location only reachable by boat. We arrived at the jetty and took the short (10 minute) trip to the hotel, passing through the hotel's water gate into a water-hyacinth choked canal leading to the landing steps of the reception. This is the only hotel on the island. The old part of the original house still remains including the old tower and the colonial rooms. As well as cottages spread through the hotels gardens, there are also eight deluxe dual-aspect lake-view villas all facing the beautiful lake to the front, and with own private swimming pool in the private rear patio and garden. The back door of the garden opens onto flooded rice paddies with a private terrace to enjoy the country view. This is absolutely peaceful & private with the natural rural country side environment surrounding you. The hotel restaurant has outside seating by the lake to enjoy the tranquillity and romantic setting. 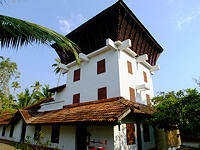 We checked in at the Malabar Purity for the night. 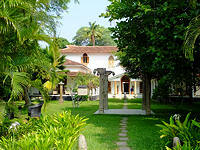 This is a beautiful boutique hotel situated along the lake. Like many of the other hotels this property was once a private lakeside mansion with the original part of the house forming the main building plus new additions in the same style added to the front and side. The beautiful inner courtyard behind the reception is the main feature of the hotel. It reminds me of Chinese traditional grand old houses where there was inner courtyard between each wing of the house. The hotel uses this wonderful courtyard as the hotel restaurant. The night I tried the Karimeen (fried fish with spices cooked in banana leaves) and it was delicious. Next morning our Spice Coast Cruise came to the Purity hotel landing and picked us up for our backwater cruise. 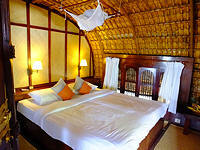 The Spice Coast cruise is a traditional style boat with bamboo roof and wooden panels. Ours is the smaller boat with one bedroom. We were greeted by the skipper Tomy (his English name), Sanl his mate and Sarath the chef. A cold fresh fruit juice was ready for us to welcome us on board. Our two heavy bags were put into our cabin within seconds without us even noticing. Our cabin was a cosy double with en-suite hot water shower room facility. The room décor was simple amd elegant blending in with the traditional bamboo and wood. In front of our room, the open space under the curved bamboo roof was arranged with a round dining table and two cane armchairs. A step up from this dining area there was a lounging platform with cushions to enjoy the sun and the view. 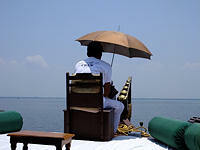 Tomy or Sanl steer the boat from the very front, using an umbrella for shade. A narrow corridor to the side of our cabin led to the back of the boat where Sarath would prepare our lunch & dinner. The smell of spices from his cooking filled the air throughout the day. Sanl, the mate, showed us on the map where our two day/one night boat journey would go. There are longer cruises available, two nights/three days as well as even longer trips of three to five nights also. Soon lunch was served with lovely fried fish from the lake cooked with spices. Delicious, especially while eating and cruising on the beautiful lake with palm trees and local boats sailing by. We stopped near a local village after our lunch. It was time for our team to have their lunch too. We got off the boat and took a walk along the edge of the water passing many local houses and rice fields on the other side of the path. We came across ducks, chickens, jackfruit and local people washing by the waters edge. Local children from some houses came out to say hello as we walked past their houses. It seems we have brought joy to them but they have also given us pleasure in visitomg their beautiful countryside and waterways. The landscape of daily life began to be revealed as we cruised on, such as local churches, duck farms and women washing clothes etc. The best and most beautiful part is when our boat entered the narrow waterways. The overwhelming greenery in all shades of green filled my vision. A powerful sense of excitement as well as relaxation came over me. We passed local houses, traders with boatloads of fruits and vegetables, and local people bathing or swimming in the water etc. A picture of peace & tranquillity. Afternoon tea was served for us with local Indian snacks. As the sun began to sink on the horizon our boat moored for the night. As darkness fell our cabin was prepared for us with mosquito net down over the bed, windows shuttered and doors closed and the air conditioning turned on for comfort during the night. Dinner was served at eight, chicken curry & beef. We enjoyed beer and wine bought for us earlier by Sarath in the local village. The cruise team retreated to their kitchen leaving us to enjoy our dinner in the peaceful evening. Surprisingly there were no insects to bother us and the night was very peaceful except for an occasional dog barking. I was woken up by the sound and smell of our breakfast around seven o'clock. We were served coffee, fresh pineapple & local Indian breakfast. This morning we cruised back to the Spice Coast cruise headquarters for our departure. The one day one night cruise had been so enjoyable I wished that I had booked a two night/three day cruise. The scenic journey was lovely and peaceful with beautiful countryside and local life. The cruise team provided us with excellent services. The chef also cooked delicious meals for us. I had always wanted to do this backwater cruise and it proved well up to my expectations. Our driver, Shivan, was at the landing waiting for us to drive us away to our beach resort.